and this fellow guarding the salad menu. A mural painted on the side of the restaurant gives us a glimpse of a street car and Selkirk Avenue’s glory days in the 1930s -1950s and another mural takes us back even further to the late 1800s and ox cart days. Scenes from the movies Capote and Shall We Dance were filmed in the Windmill. How’s that for a a claim to fame? If you want to follow in the footsteps of the likes of Jennifer Lopez, Richard Gere, Philip Seymour Hoffman and Catherine Keener wander on over to the Windmill Restaurant and get a blast from the past. Other posts about restaurants and movies made in Winnipeg…. They came from all over Canada. A couple of weeks ago when I volunteered at the Mennonite Central Committee Thrift Shop on Selkirk Avenue we were inundated with two bus loads of visitors. These were Thrift Shop administrators, volunteers, board members and executive members from other cities. They had come to Winnipeg for a conference called Embrace the Movement where they could share ideas about how to run thrift stores more effectively and efficiently and to receive information and inspiration from guest speakers. I talked with people from Saskatchewan, British Columbia, Ontario and other places in Manitoba. They were touring Manitoba Thrift Stores after spending a number of days attending workshops that addressed such things as recruiting volunteers, creating safe shopping and working environments, dealing peacefully and in restorative ways with shop lifters, quick merchandise turn around and handling conflict. It’s the day after Mother’s Day and mothers are trying to find places to put all those lovely little gifts they received. Their hearts were touched by the sentiment the presents conveyed but what will they do with all those sweet knick knacks? I was working at the Mennonite Central Committee Thrift Store on Selkirk Avenue in Winnipeg last week and Mother’s Day kitsch was flying off our shelves. I took some photos before it was all gone. This house is full of some “pretty cool old stuff”, said a child who happened to be visiting the Seven Oaks Museum at the same time as I was last weekend. I agreed with her. I was taking a free guided tour of the site as part of Winnipeg’s Doors Open event. 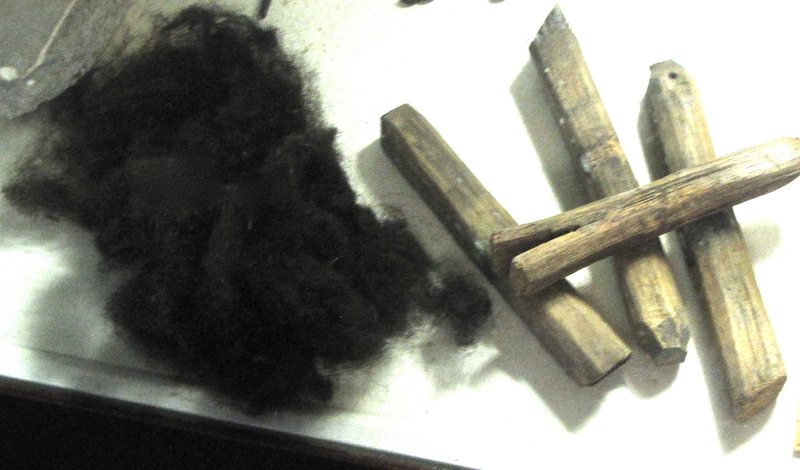 Bison hair was used for insulation and wooden nails for construction of the house in 1853. It was built by John and Mary Inkster who were prosperous farmers, traders and merchants. 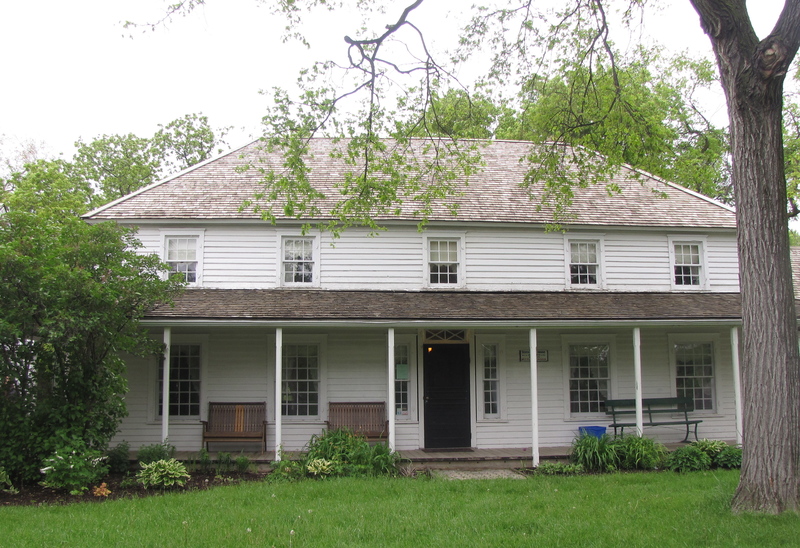 The house was called Seven Oaks because of the seven oak trees standing nearby which mark the site of the Battle of Seven Oaks in 1816 between the Hudson’s Bay Trading Company and their allies and the North West Trading Company and their allies. 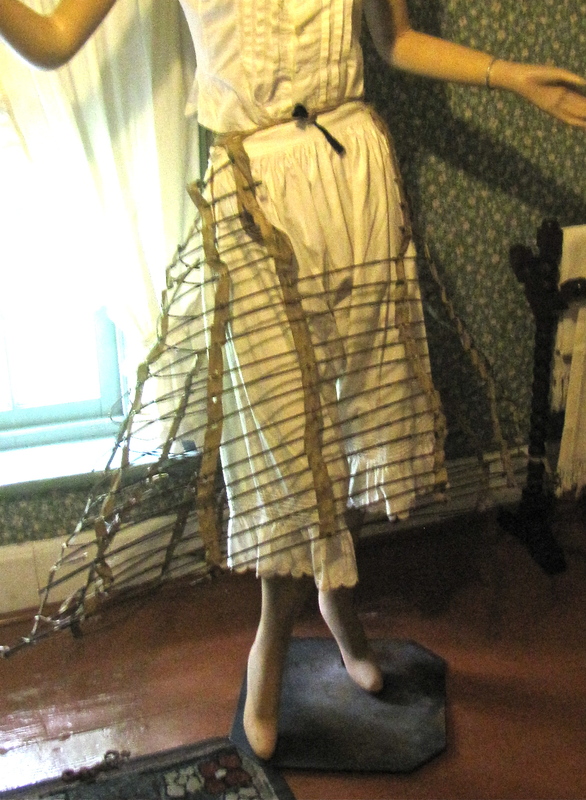 The Inksters had five daughters and they and their mother wore wire hoop skirts like this one under their dresses. It doesn’t look very comfortable. This artifact is just a little creepy. 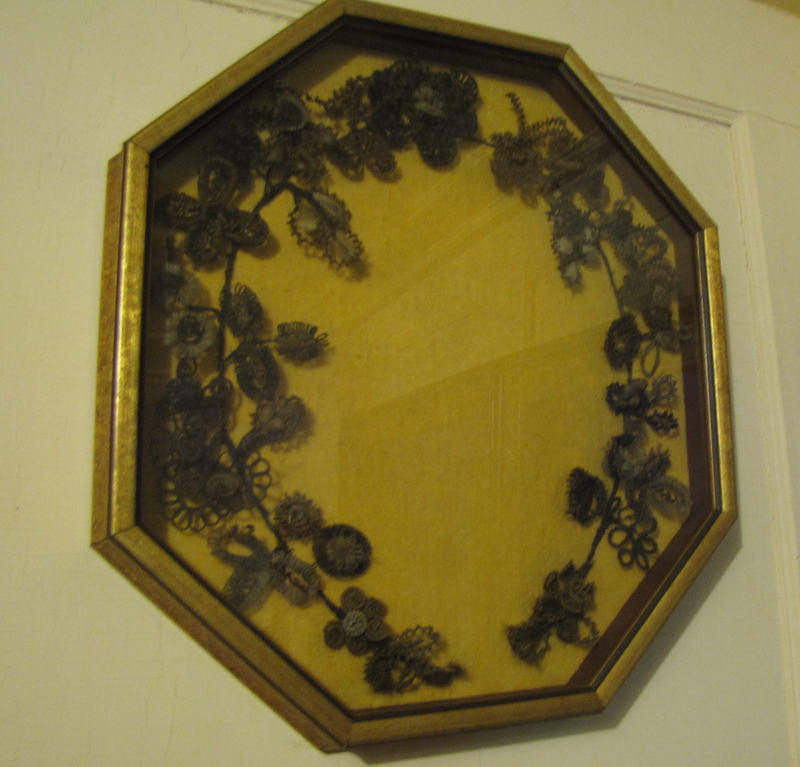 It is a memorial wreath made of human hair. No doubt the hair is from an Inkster family relative who had passed away. The human hair of a deceased person has been twisted around a wire to create a floral design. Apparently some of these wreaths even had a photo or painting of the dead person in the middle. Apparently women’s magazines at the time often featured designs and patterns for making these hair wreaths. This is not a fancy tea-cup on a place mat. 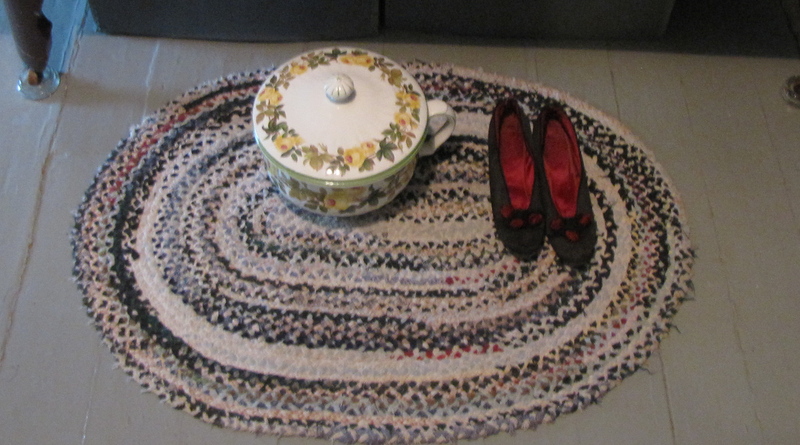 It is a chamber pot on a braided rug. Before the advent of indoor plumbing chamber pots were kept at the end of the bed for night-time toileting needs. The chamber pot’s more crass name was piss pot. 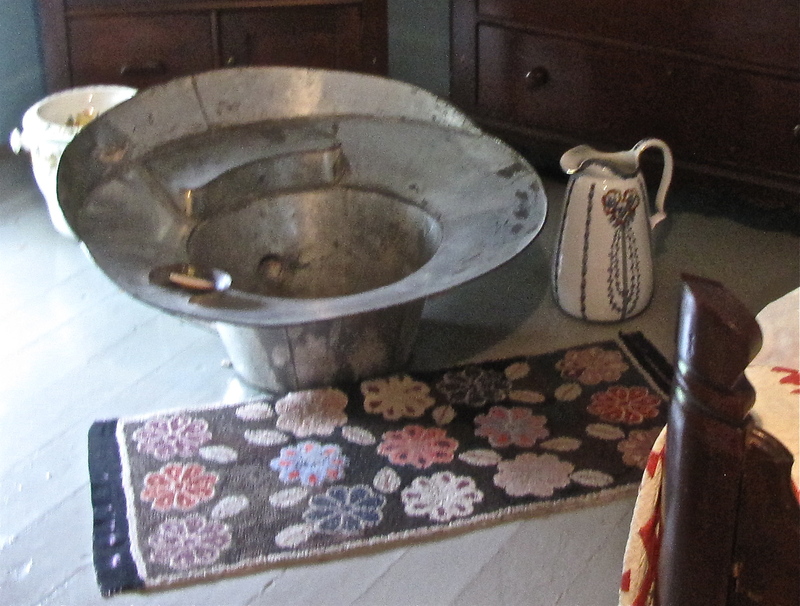 Here is the tin tub the Inkster family of eleven used for their baths. The water was heated in the stove in the kitchen on the main floor and then hauled upstairs for bathing. John Inkster, a stone mason came to Canada from the Orkney Islands. So did Mary Sinclair’s father William. However Mary’s mother, who was also called Mary, was Metis, the daughter of a Frenchman and a Cree woman. According to the The Encycolpedia of Saskatchewan, Metis girls were taught to sew and do beadwork already at a young age. 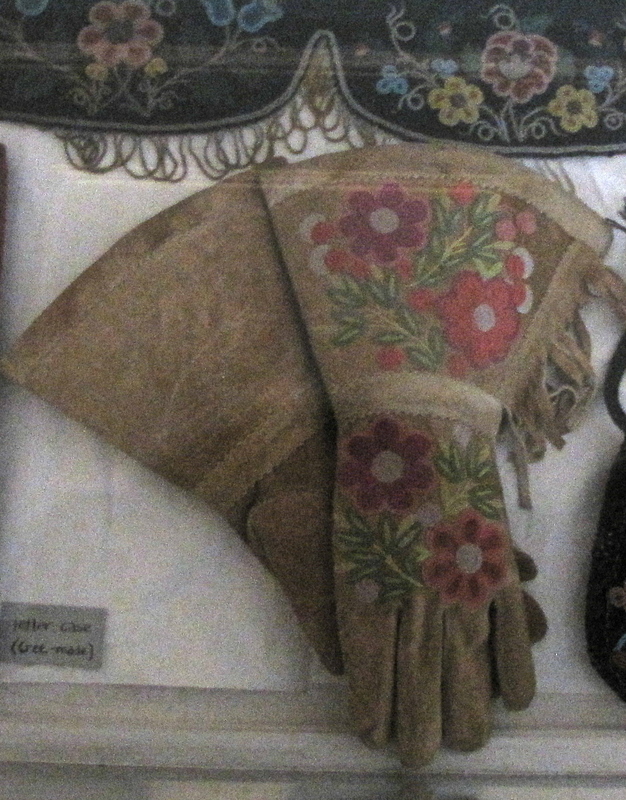 Mary Inkster made these beautiful gloves using the needlework skills she was taught by her Metis mother. 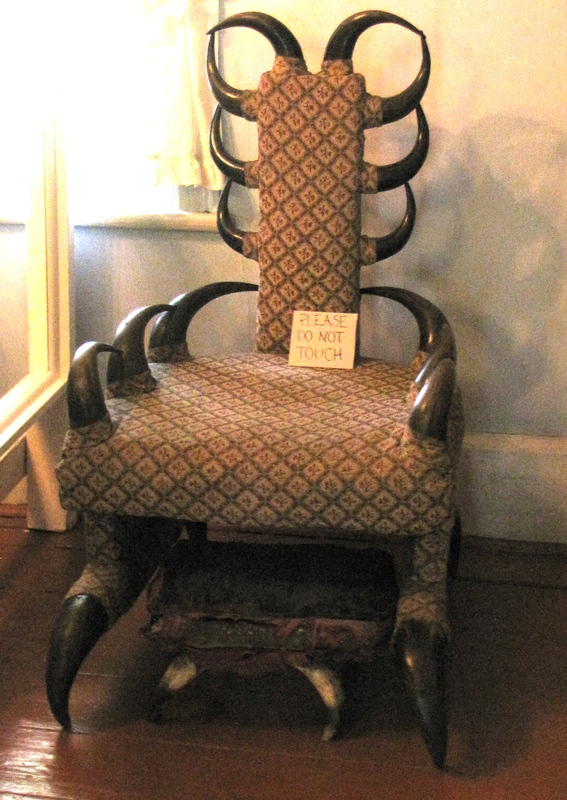 The furniture in the house was all hand-made and some of it looked very comfortable, but this padded chair decorated with bison horns would not have been my first choice for seating. 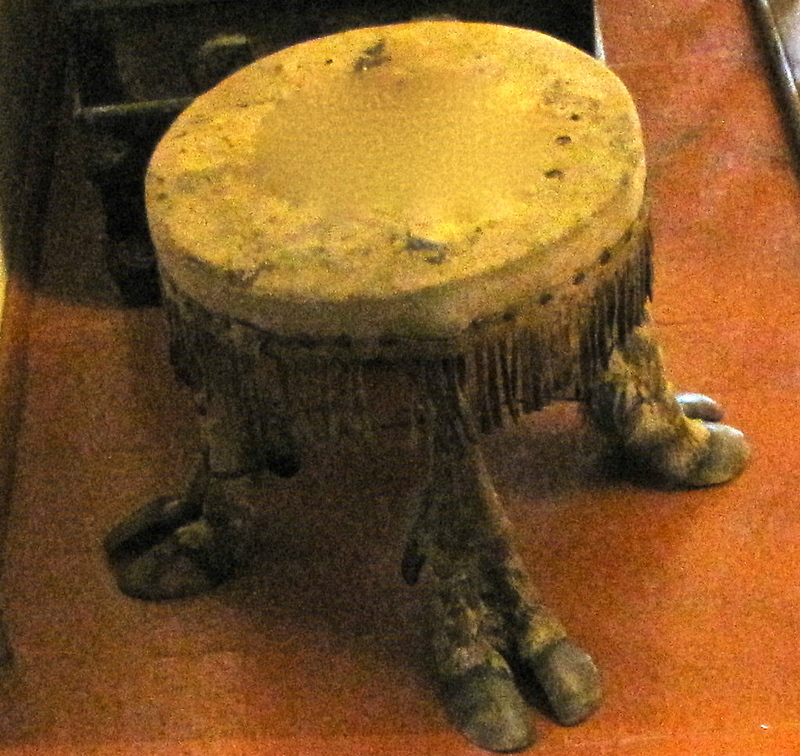 I would probably have also given this caribou footstool a pass. One of the bedrooms in the Seven Oaks house has a hammock instead of a bed. 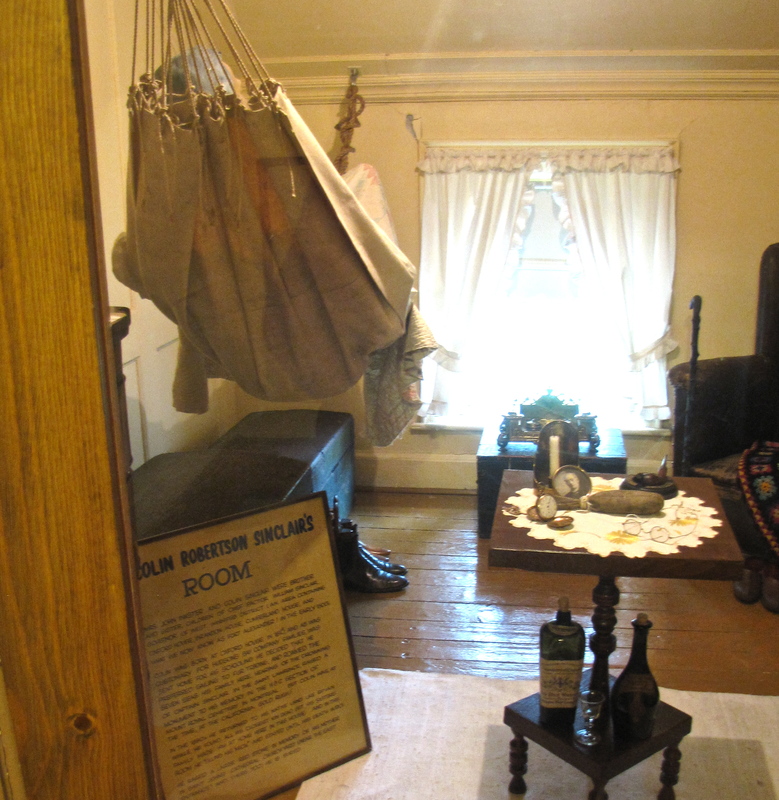 The room belonged to Colin Sinclair, Mary’s brother, who was a sea-captain. He retired to his sister’s house when his career was over. He was so used to sleeping in a hammock on the ship that he had one installed in his bedroom at Seven Oaks. 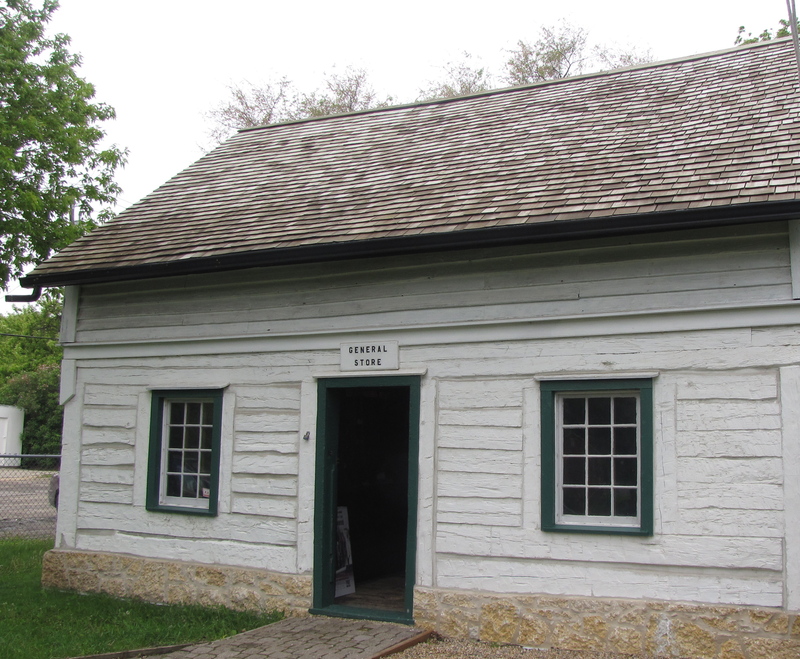 Next to the house is the store and post office run by Mary and John Inkster. John imported goods from England by way of Hudson Bay and brought them to the Red River Settlement by York boats. His American goods came from St. Paul by Red River carts. Mary worked in the store and her children said her ability to add up columns of figures and balance accounts was remarkable. John Inkster was an active member of Winnipeg’s civic, church and business community. Inkster School and Inkster Boulevard in Winnipeg are named after him. Mary Inkster ran a household for her family of nine children and helped her husband with his business. Today Dave and I stopped by Gunn’s Bakery on Selkirk Avenue to get some pumpernickel bread and crusty rolls for our lunch. Gunn’s is a Winnipeg landmark founded in 1937 by Florence and Morris Gunn, the couple featured in this mural on the building beside Gunn’s Bakery. Morris,whose father was a baker, immigrated to Canada from Poland in 1926 and worked hard in a Winnipeg bakery to save enough money so in 1930 he could bring his fiancée Florence to Canada and they could get married. The couple had three children and eventually gathered enough resources to open their own bakery at 247 Selkirk Avenue . At first they lived in the back of the bakery, but as their business and their family grew they had to buy a separate home. 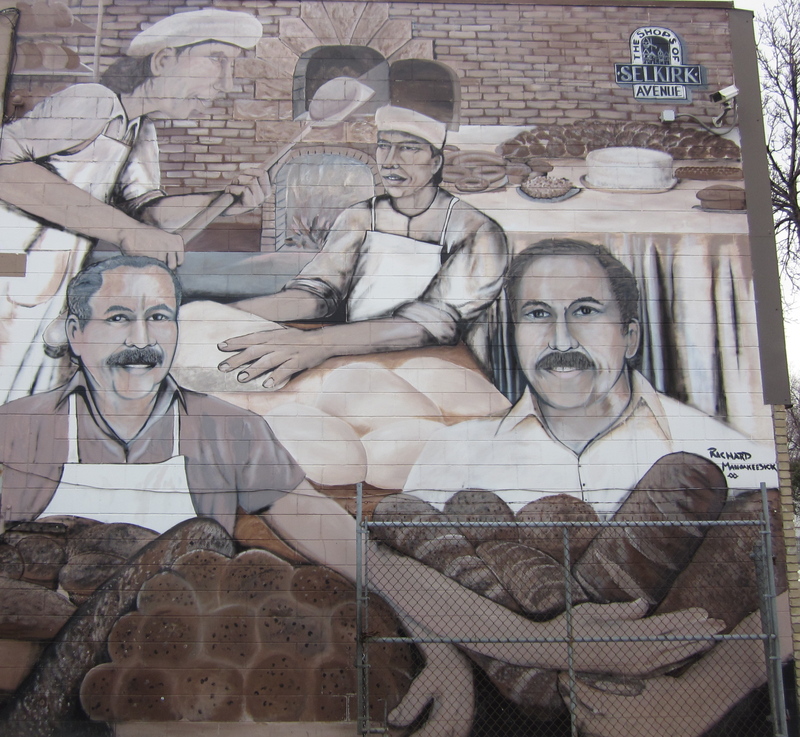 Gunn’s Bakery is still at 247 Selkirk and now it is run by Morris and Florence’s sons Arthur and Bernie. Arthur who has his Masters Bakers Certificate is in charge of the producing all the baked goods, including the 25 kinds of bagels Gunn’s is famous for. Bernie, who is an accountant and business administrator takes care of the finances. Morris passed on everything he knew about baking to Arthur before he died in 1973. Florence lived till 1998, long enough to see her family’s business expand to a 24 hour a day operation that employs some 80 people. Nothing at Gunn’s is mass-produced and many of the products are still being made with Florence and Morris’ original recipes. Devout Jews, Florence and Morris wanted to have a kosher bakery and sought rabbinical supervision to insure that was the case. Morris and Arthur have maintained that tradition. Although they have introduced many new products they continue to make the European breads and pastries that were familiar to their parents’ neighbours in the North End of Winnipeg in the 1930’s and 1940’s. 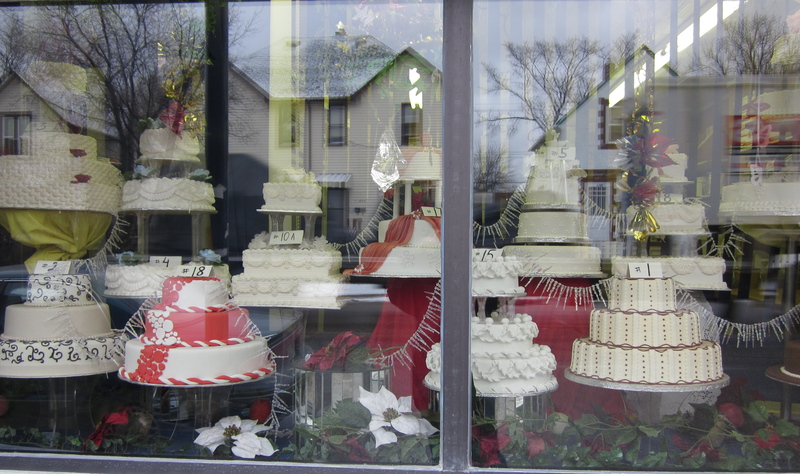 Gunn’s is famous for its wedding cakes and in a radio interview Arthur said people come in to the bakery to order wedding cakes for their children and tell him their own wedding cakes were made by Arthur’s father Morris. It wasn’t easy to walk out of Gunn’s with only our bread and rolls. We spent a fair bit of time eyeing all the luscious looking pastries but managed to have enough self -control to leave without buying any. 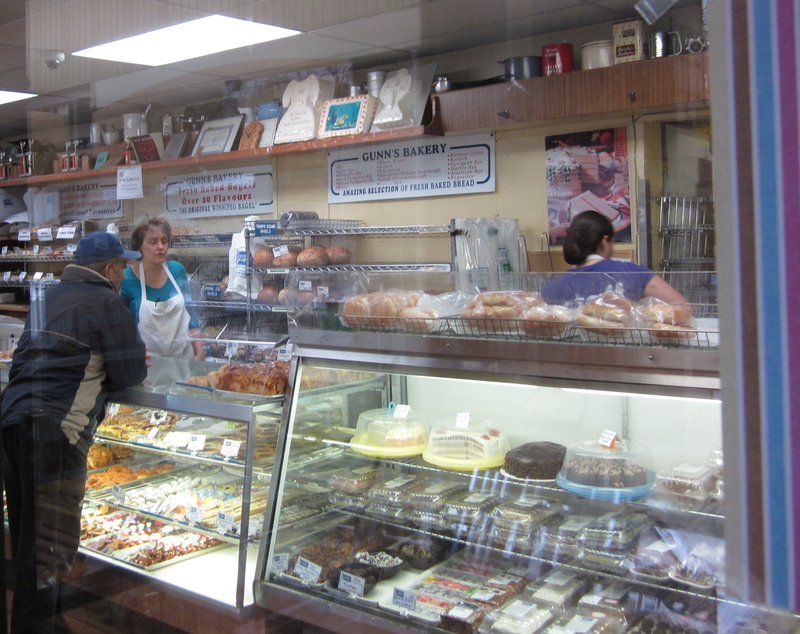 “Are you sure you wouldn’t like anything else?” the friendly clerk asked as Dave pointed to various desserts. “We’ll be back,” he said as I led him out of the store. I’m sure we will.